Many people died in 2013 due to a natural disaster near Kedarnath temple. The tragedy was that the people who died in it were mostly ardent devotees. They came on a pilgrimage to pay respects to their beloved God, Shiva, without knowing that it would be their final journey (mahaprastanam) and their lives would be consumed in the fury of Nature. Kedarnath temple has a long history. According to the legends, it was originally built by the Pandavas during the Mahabharata times and ever since the deity has been revered by Hindus as one of the 12 Jyotirlingas. It is also one of the four most sacred places of Hindus (char dham). The current temple was said to have been built in the eighth century A.D., and visited by Sri Adi Shankaracharya. It is also one of the famous Hindu temples, located at a very high altitude of 11,755 ft. The temple survived the ravages of the flood with minor damages, but many pilgrims who were resting in the buildings and shelters near the temple at the time of the disaster died in sleep due to sudden landslides, mudslides and flash flood. News reports indicated that that the incident shook the faith of many in God’s ability to protect his own devotees, and some had even vowed to visit the place never again. The tragedy raised an important question. Does God really care about his devotees? In the scriptures, he claims them to be his dearest souls, promises to reciprocate their love and devotion and rescue them from the ocean of suffering. Then why did he fail in case of the Kedarnath temple? How could have people who visited a sacred temple or who went on a religious pilgrimage met with such a terrible fate? If God was indeed the protector of the pious and devoted, how a tragedy of such magnitude would have happened, and why would he even let it happen? One of the Shankaracharyas said to have commented that it happened because Siva was angry with the ways of the world and the increasing sinful conduct of people. Now, surely Shiva did not speak to anyone about his anger or disappointment with the world or people. It is difficult to believe that he would just pick one spot of all the places to punish people who were religious and devoted, ignoring the rest of the world where most sinners live, who never bother to show any devotion to any god or deity or visit any temple or place of worship. Therefore, whatever the blessed Shankaracharya said was mostly his conjecture or opinion, not a fact. Another story was also circulated by the local media. 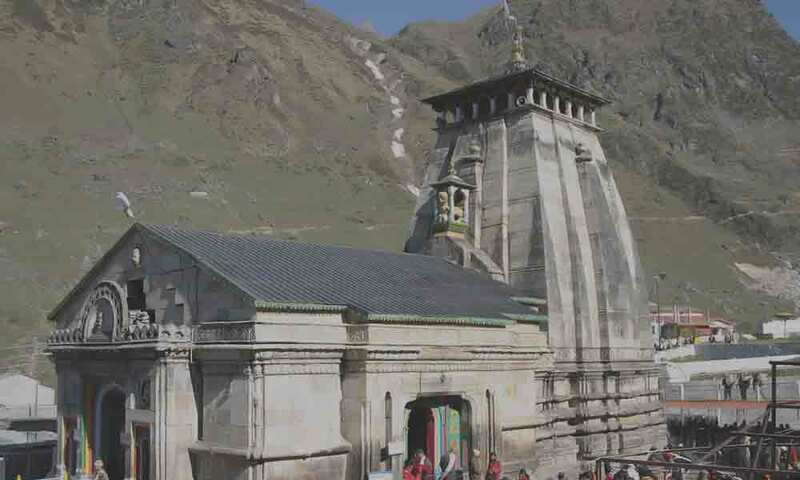 According to it the Kedarnath tragedy happened because authorities moved the statue of the temple goddess from one place to another to perform some repairs to the temple. The gods and goddesses of Hinduism belong to the higher planes of creation. They partake the nature of God and personify purity, love, compassion and other divine virtues. It is difficult to believe that they are susceptible to emotional instability or human frailty, or experience negative emotions such as fear, anger, envy or frustration as ordinary mortals. Whatever emotion we may attribute to them, they are our own projections into our idea of them, not the reality. The Puranas are mostly fictional renditions in which facts are buried in legends and ancient lore. Their purpose is to inculcate devotion and religiosity and provide spiritual guidance. They help the devotees who study them to contemplate upon the splendor and greatness of gods. They may contain some factual information, but their main purpose is not to present an accurate, chronological and historical account of the cosmic events or the world. Television serials may show them as emotional beings to spice up the stories and attract viewers. They may show Shiva and Parvathi as ordinary householders weeping and crying or getting angry or annoyed for every small inconvenience, with disturbing musical scores playing in the background. However, such depictions appeal to our raw emotions and passions, rather than our spirituality and higher nature, and they are completely unjustified. They do not make sense when you envision Shiva in his highest aspect as Isvara or the Lord of the Universe. The scriptures describe him as a pure and auspicious being (shivam), who is made up of pure (shuddha) Sattva. As pure consciousness, he is supposed to be the same amidst the dualities, equal to all, indifferent and undisturbed. A lord of that stature, who rules over millions of worlds and beings of diverse names and forms, cannot be an unstable being. As the transcendental being of light and wisdom, who is beyond the mind and senses, he cannot be susceptible to human passions and emotions or acts like deluded humans. With such weaknesses, no divinity can ensure the order and regularity of the world. It is an affront to godhood to believe that God would be so disturbed by the sins of the world that he would a pick a few thousand people who were visiting the Kedarnath temple on that fateful day and punish them to set an example to the rest of the world. It does not even make sense that a god of the stature of Shiva or Vishnu would punish humans for their sinful conduct, however transgressive it may be, when beings are meant to be ignorant, deluded and egoistic due to their ignorance, predominance of the gunas or delusion or Maya. Human beings are meant to be a mixture of good and evil. They are supposed to act in ignorant ways due to their desires and attachments and remain bound to the mortal world and the cycle of births and deaths. They continue to do so birth after death, according to their karma and the laws of Nature, until they cultivate discernment and become wiser. Engaging in sinful behavior is natural in the mortal world. All beings are destined to be so, until they reach a certain level of perfection and purification. Therefore, logically, gods will be annoyed if the mortals disobey the laws of Nature and try to escape from this world through austerities and virtuous conduct rather than when they lead normal lives, acting according to their gunas. The Vedas indicate that our gods are displeased if humans defy them by ignoring their duties, or try to escape from the cycle of births and deaths by engaging in spiritual activity to achieve liberation. They are pleased only when householders perform sacrifices to nourish them with sacred offerings. Just as we feel inconvenienced if we cannot obtain food from plants and animals, they become unhappy if they do not receive offerings or if devotees do not regularly serve them ritual food. Therefore, the idea that our gods act out of anger or displeasure and precipitate catastrophes is erroneous. Gods are meant to ensure order and regularity, not disrupt it. They help those who pray to them, but leave the beings mostly to themselves and their karma. The highest of all, Shiva is even more tolerant and forgiving. Everything is his play in the unified consciousness. He is “is” when you think he is, and he is “is not” when you believe he is not. This is why God is considered both is and is not. Eventually, it is your beliefs and your actions which matter. God creates your reality according to your choices, decisions and actions. He remains as unobtrusive, nonobstructive and open to every possibility as space itself, so that you can exercise your free will and through your karma create your reality and destiny. When adversity strikes, it is human for people to look for causes and feel overwhelmed with negative emotions or blame the factors which might have led to it. However, to blame God for such events is irrational. In some religions, God is considered responsible for everything. As Hindus, we believe that it is possible only when we totally surrender to him and offer our lives. In Hinduism, there is no Judgment Day. Beings are responsible for their actions, unless they perform them in the name of God and for the sake of God, with detachment and as an offering. In Hinduism, the equation between people and God is rather contextual. God does not control our lives, unless we surrender to him completely and transcend the duality of subject and object and the idea of separation from him. Beings are subject to reward and punishment and judged according to their deeds. Unless we completely surrender to God and offer our lives and actions to him as a sacrifice, he remains indifferent to our actions and our lives. Letting Nature or the laws of creation to prevail. Therefore, it is very inappropriate and ignorance to blame any god or goddess for the problems we face or the suffering we undergo upon earth. If we pray, our gods will probably help us. If we do not pray, they do not punish us. They remain indifferent. If we make mistakes, they let the law of karma to take care of it. Karma is the force which binds all beings to the world. We all are its prisoners. We are primarily responsible for our lives and actions. Through our thoughts and desire-ridden actions, we create our lives. Therefore, when we suffer, we have to look within ourselves to find the causes rather than blaming gods. Just as the individual karma of a person arises from his or her actions, the collective karma of all people or a group of people also arises from their collective actions. If many people engage in evil actions and ignore their Dharma, chaos will prevail, and suffering will intensify in the world. Thus, it is either the individual karma or our collective karma or both, which create our suffering and lead to catastrophic events. In all this God is a witness, but not the cause. Therefore, let us stop blaming Shiva or the gods and goddesses for any tragedy or calamity. The Kedarnath event happened because of gross negligence by many institutions and authorities who were expected to prevent such tragedies through careful planning and prior preparation. The fact is that they were unprepared for catastrophic events and ill-equipped to deal with them when they happened. The earth is our support and source of survival and nourishment. If we harm the earth, it is very much like harming ourselves and our very chances of survival. We cannot blame God for the harm we do to our own home, the earth. In many ways, the Kedarnath tragedy was a manmade disaster. The loss of human lives was aggravated further by human failure to prevent it and inadequate arrangements to cope with it. It is wrong to blame God or any divine entity for the causes which are not difficult to discern. If at all gods intervened and played any part, which is possible, it might have been to prevent a much bigger disaster. Sometimes, God wants to help us by sending clear messages or advance warnings to caution us of an impending problem or crisis. However, we may not notice them due to our own weaknesses or preoccupation. Therefore, let us reflect upon the incident with humility and see what we can learn from it.